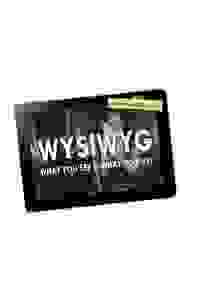 'WYSIWYG' is the story of a transgender woman who can live online as she truly is, without the ridicule she feels in society. With help from her therapy group, she must choose between the safe life she has created online and the unknown possibilities found in the real world. What You See Is What You Get. See it if if you like real stories and/or you've ever met someone on the internet that turned out to be something different than you expected. Don't see it if you are uncomfortable with adult subject matter and/or you don't want to see complex/dramatic human situations. See it if You like complex plays about complex subjects. Identity is not always a cut and dried matter, especially where gender is involved. Don't see it if You are impatient about plays which deal with complex and unresolved personal issues. See it if you are open to shows that are not 100% ready. It's a neat idea, and I especially liked the drinking song. Don't see it if you don't care for gay/trans/LGBTQ shows. See it if Want to support art that highlights trans actors. Don't see it if You are looking for a show that has variety in the score. See it if you’re interested in a show re an ordinary trans person seeking love through ordinary means. Story is worth developing. Endearing lead. Don't see it if The writing is very subpar romcom. All but a couple of the songs sound the same (partly bc all piano music). Needs variety. Also A good idea for a musical even if the current writing/music don’t make a strong impression. Slow start. There are lulls when the show is 65 and a few flashpoints at 75. A lot more about acceptance of self/others and less about how technology has fundamentally changed communication and dating—so it’s not as cutting edge as I expected. See it if you like new musical theatre in its early stages, expecially supporting the trans community. Don't see it if you want to see a completed, fresh musical. If you don't like to view sexual references and inuendos, skip this. Also As a song writer myself, I completely support all of us working on our craft. the singers/actors worked very hard and were quite successful with their performances. The piano, however, regularly overpowered the voices (a problem I've experienced before in this theatre) and I was sorry the accompanist didn't play more sensitively in support of the emotions of the songs and singers. See it if You're playwright looking for what not to do. See if interested in personal development. Don't see it if You want a multilayered well developed storyline. See it if You want to support an earnest work dealing with trans issues. Don't see it if You want to an engaging piece of theater. The plot is trite. The songs sound the same. The characters are 2-dimensional and inconsistent. See it if you love musicals and want to support an artist’s project. If you are interested in the depiction of trans issues. Don't see it if you expect a finished work that is presentable to an audience. You are not deeply interested in trans themes. See it if you support LGBTQ community. It is relevant to this time and date. Don't see it if You dislike super small scale production. Singing is mediocre at best. Acting needs a little work. Very hard sit through a weak story.